Stan Royer had seen the majors, but not like this. 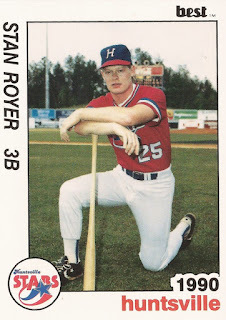 In three previous seasons, Royer saw St. Louis as a September call-up or, in 1993, earlier in the year. In 1994, though, Royer made the big club out of spring training. "It's a different feeling," Royer told The St. Louis Post-Dispatch. "But it's only different in circumstances. In my mind, I'm still trying to make the team." Royer finished that year, the shortened 1994 season, with 43 games played, a career high. That year, though, also turned out to be a his last as a pro. He finished with 89 big league appearances and a career major league average of .250. Royer's carer began in 1988, taken by the Athletics in the first round of the draft out of Eastern Illinois University. Royer started with the Athletics at short-season Southern Oregon. He moved to single-A Modesto in 1989, getting a brief look at AAA Tacoma. He saw AA Huntsville in 1990, then moved to the Cardinals late in the year in the trade that sent Willie McGee to Oakland. Royer debuted in St. Louis in September 1991. He got into nine games and hit .286. He returned for another 13 games in September 1992. He hit his first major league home run Sept. 20 in a Cardinals win against the Cubs at Wrigley Field. "I'm glad I got it here," Royer told The Associated Press afterward of Wrigley. "I love this ball park,"
Royer then played in 24 games in 1993 and those 43 games in 1994. He moved to the Red Sox in July, taken off waivers. He played his final game that July 22. Royer has since gone into wealth management, serving as president and co-founder of Claris Advisors in St. Louis. In 2011, he returned home and visited one of the fields he played on in Little League and offered his insight to the youth there. "We try to set the expectations for kids to let them know it is a very difficult road. But that doesn't means it's not doable," Royer told The Effingham Daily News. "I'm standing here in front of them, and I played at these fields like they did."